Our screening in Manhattan at the School of Visual Arts Theatre drew 350+. We're on KANOPY.COM! It streams educational videos into schools, universities, libraries and other educational institutions. We will soon be distributing our 50-min. version of NIGHT BIRD SONG through Kanopy.com to subscribers. Please check to see if you are a subscriber and can already stream this video into your educational venue. Abby London-Crawford, Associate Producer/Screening Coordinator at abrajazzbra@aol.com. Screenings and bookings have been happening since January 2016, when the film was completed. 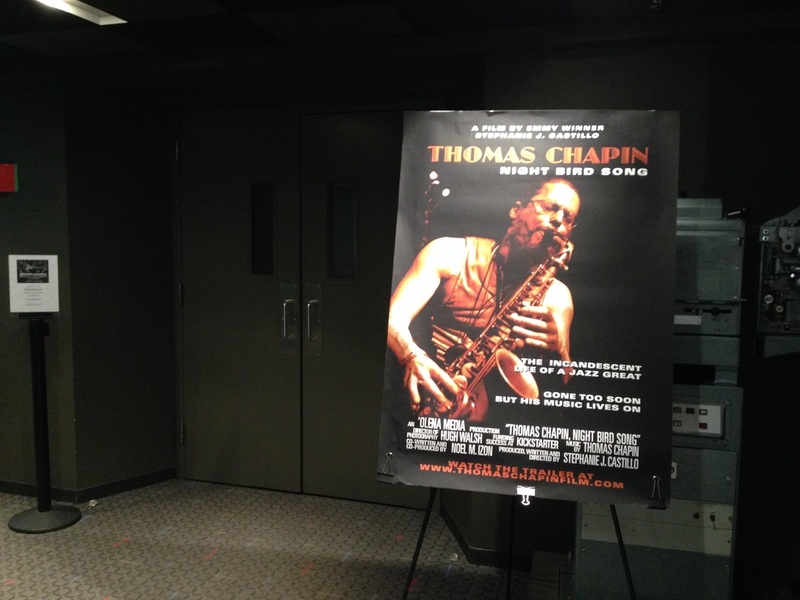 Our mission is to share Thomas Chapin with the world. Your screening or booking will help us accomplish this! So we want to be helpful and make it work for you, and to keep it affordable and within your own or your organization’s goals and missions as well as budget. 1) Unless you have already seen the film, you will be asked to first view the 7-min. trailer; this will give you a good idea of what the film is about. Click here to see the trailer. 2) After viewing the trailer, you will be asked to watch the film via an online screener. We will send you that link. We want to be sure the film is a good fit for your purposes. 4) You should already have a screening date in mind. ​All fees are negotiable and are considered tax-deductible donations to the film through Akasha, Inc., a 501 (c) (3). -- Free — to middle and high school school programs, if they have no budget. Or $300-$500 otherwise, depending on your budget. This fee helps us to keep the film project going. -- 50/50 Split — for bookings, when admission is charged. We encourage you to include the community, or other academic departments, in your screenings if possible. -- Jazz Festivals — $300 - $500, depending on the budget. 1) Honorarium — we ask an honorarium of $300 - $500 per person, depending on the budget. Screening DVDs must be returned after the completed showing. No copying allowed. Written feedback from audiences or viewers is welcomed for our Film Comments Page at our film’s website at www.thomaschapinfilm.com. Asking for donations to the project from the audiences is always welcomed to help us keep going.